Project Rachel is a network of specially trained, compassionate caregivers, who are prepared to assist those who suffer from abortion loss. Learn more about Project Rachel from Vicki Thorn, foundress and the executive director of the National Office of Post-Abortion Reconciliation & Healing located in Milwaukee, Wisconsin. If you are having trouble viewing video click here. Please note: a black space may be shown if you are using Internet Explorer. For more information see frequently asked question tab below. 1-516-766-2538 or 1(888) 456-HOPE (4673) se habla espanol | Email projectrachel@drvc.org to begin healing after abortion loss. What happens after I register on line? Once you register on line you will receive an email from the Project Rachel team asking to set up a time to talk and complete your registration. All information is kept confidential. What happens once I leave a message on the Project Rachel phone line? Once you leave a message on the phone line, someone from the Project Rachel team will get back to you to answer questions and take your registration information. What happens at a Day of Prayer and Healing? A Day of Prayer and Healing is a full day retreat. The day begins with a witness speaker and includes prayer, group discussion, refreshments, lunch, a Holy Hour, an opportunity for the Sacrament of Reconciliation or for non-Catholics an opportunity to talk with a priest, and the celebration of Mass. I am not Catholic. Can I still attend a Day of Prayer and Healing? Is the Day of Prayer and Healing confidential? Yes. We do not talk about the Day outside of the gathering. We ask all who attend to honor this confidentiality. What if I do not want to share or talk in the group discussion? That is perfectly fine. No one is pressured to speak. There is still a lot to be gained by being part of the group. I have already been to confession about my abortion(s) but still don’t feel forgiven. Should I still come to the Day of Prayer and Healing? Yes, you are welcome to attend a Day of Prayer and Healing. The journey to healing is a process that takes time. This retreat is an opportunity to experience the mercy of the Father and to open yourself up to His forgiveness. It is our hope that through this retreat you will find the peace you are seeking. How long is a Day of Prayer and Healing? The time varies but the day usually runs from 9:00am to 5:00pm. After you register you will get more specific times. No. Lunch is provided, however, it you have special dietary needs please let us know. If we cannot accommodate your dietary need you many need to bring lunch. No. Free will offerings are gratefully accepted. Where is the Day of Prayer and Healing held? Due to the confidentiality of this ministry we do not post or disclose the location of the Day of Prayer and Healing until after a woman has completed her registration. What happens after a Day of Prayer and Healing? After attending a Day of Prayer and Healing you are welcome to attend Gatherings that are held 6 times during the year. You will also have the opportunity to join a spirituality class if you choose. An Evening of Prayer for Men is an opportunity to experience the loving mercy of God in a safe and sacred space. The evening is directed by a spiritual team who have a sensitivity and a heart for those who suffer. For more information call Project Rachel at 1-516-766-2538 or 1(888) 456-HOPE (4673). Once you register on line within a few days you will receive an email from the Project Rachel Ministry Coordinator with details about the event. All information is kept confidential. Where is the location of the Evening of Prayer? Due to the confidentiality of this ministry we do not post or disclose the location of the Evening of Prayer until after a man has completed his registration. What happens at an Evening of Prayer for Men Suffering Abortion Loss? Who is presiding at the Mass and hearing confessions*? The presider is Reverend Steven J. Pietrowski. *If necessary other priests will assist in the Sacrament of Reconciliation. If you would like more information, please contact Project Rachel for further details. I am not Catholic. Can I still attend and Evening of Prayer? Yes. All are welcome to come and pray. Is the Evening of Prayer for Men Suffering Abortion Loss confidential? Yes. We do not talk about the evening outside of the gathering. We ask all who attend to honor this confidentiality. If you would like additional information, please contact Project Rachel at 1-516-766-2538 or 1(888) 456-HOPE (4673), projectrachel@drvc.org. All information is kept confidential. Father, source of healing and forgiveness, we pray for all parents overwhelmed by grief and sorrow at the loss of their son or daughter to abortion: You never abandon those who hope in you; so we pray that the hearts of those wounded by their abortion might be open to your Divine Mercy that they would know the grace of repentance and so experience the embrace of the Father. We pray that Jesus, the Good Shepherd, so rich in love and compassion, may hear the cry and see the tears of each of these mothers and fathers so He may heal their broken hearts and restore them to life. Give these grieving mothers and fathers the consolation of believing and trusting that her child is now living in the Lord that this may soothe the terror of their soul. We pray that the Blessed Virgin Mary, Mother of all tenderness and our Mother, may strengthen their faith in You. We ask this through Christ our Lord, who conquered sin and death, and who lives with you, in the unity of the Holy Spirit, one God, for ever and ever. Amen. Gracious Father, I thank you for the mercy you have shown in forgiving my sins and for the peace that comes from being reconciled with you and with your Church. O God, you are faithful, and you never abandon those who hope in you. I know that my redemption from sin and death has been purchased at the cost of your Son’s blood. In return for this priceless gift, I resolve today to renew my trust in your unfailing mercy. In times of doubt, when painful memories of past sins threaten to destroy the peace you have given, let the power of your Holy Spirit cast out all self-condemnation and give me greater confidence in your word of pardon. Teach me to encourage others so they, too, may seek your tender compassion and come to know your peace, which nothing can take away. I pray this in the name of Jesus, your Son, in whom you have restored me to life. Amen. 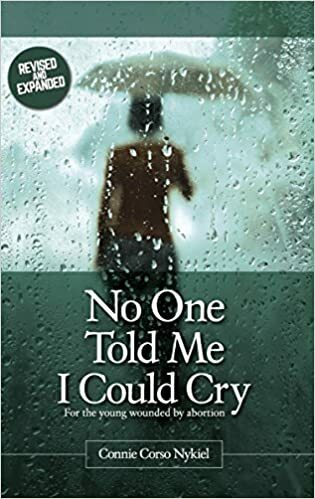 No One Told Me I Could Cry by Connie Corso Nykiel – Connie Corso Nykiel writes from her wealth of experience as a nurse working with pregnant young women and grieving women. Hers is a message of joy and hope for those who have experienced abortion. She reveals how it is only in grieving that they can find healing and truly be reconciled to God and their child. Through the guidance of an experienced professional, they can learn to cry and find fullness of life. This books is a treasured guide to healing for those who have experienced abortion. It also provides an abundance of information for teachers, counselors, pastors, social workers, health care workers and all those who work with post abortive and/or pregnant teens. Each human being is unique, unrepeatable, and infinitely precious to God. In becoming man and by his death on the cross, Jesus showed us the incomparable value of each human life, making his human life the “instrument of the salvation of all humanity!” (The Gospel of Life, no. 33).